The Movement Toolbar contains a collection of tools for moving, rotating, or scaling bones as well as how they are moved, rotated, or scaled with Grid Snapping. This toolbar also has an option for setting the relative coordinate system for movement or rotation as well as an option to set the camera movement speed when moving around in the viewport. The last option scales skeletal bones (if applicable, grayed out by default). Sets the relative coordinate system for moving and rotating the mesh (World or Local). Enables or disables snapping to the grid when dragging objects around and the Position Grid Snap value. Enables or disables snapping to the grid when rotating objects around and the Rotation Grid Snap value. Enables or disables snapping to the grid when scaling objects and the Scale Grid Snap value. Adjust the speed of the camera while moving around in the viewport. The View Options Toolbar contains a series of buttons that hold options for what is displayed in the viewport. Auto Previews whatever is active in the viewport. Lock Locks the viewport to what is currently being previewed. This allows you to preview one item while viewing or editing another. Camera Follow Follow the bounds of the mesh. In-game Bound Uses in-game bounds on the preview mesh. Perspective Switches the viewport to perspective view (this is the default setting). Top Switches the viewport to top view. Side Switches the viewport to side view. Front Switches the viewport to front view. Lit Renders the scene with normal lighting (this is the default setting). Unlit Renders the scene with no lighting. Wireframe Renders the scene in brush wireframe. Detail Lighting Renders the scene with detail lighting only. Lighting Only Renders the scene with lights only, no textures. Light Complexity Renders the scene with light complexity visualization. Shader Complexity Renders the scene with shader complexity visualization. Stationary Light Overlap Visualizes overlap of stationary lights. Lightmap Density Renders the scene with lightmap density visualization. Reflections Renders the scene with reflections only. Exposure Use automatic exposure or set a fixed exposure value. Field of View Adjust the viewports field of view. Mute Audio Mutes audio from the preview. 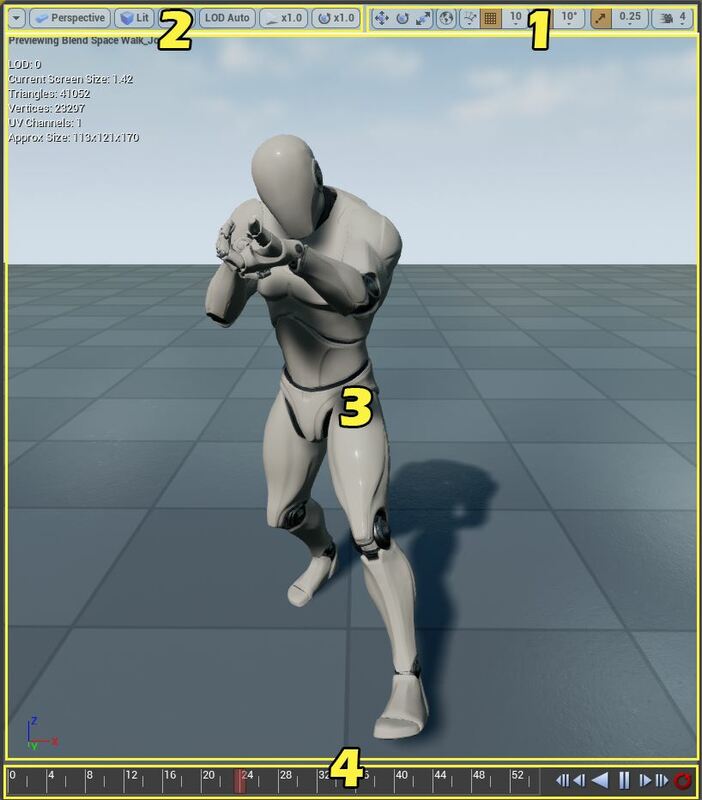 Reference Pose Shows the reference pose on the preview mesh. Bound Shows bounds on the preview mesh. 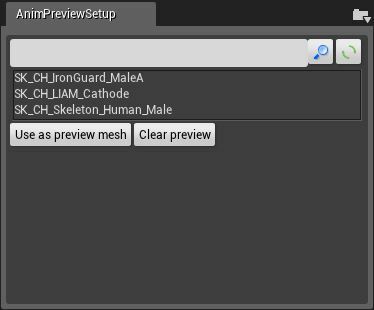 Mesh Shows the preview mesh. Uncompressed Animation Displays the skeleton with uncompressed animation data. NonRetargeted Animation Displays the skeleton with non-retargeted animation data. Additive Base Displays the skeleton in an additive base pose. Bones Display skeleton in viewport. Bone Names Display Bone Names of the skeleton in the viewport. View Selected Bone Weight Displays the weights of the selected bones in the viewport. Display Info Displays information about the mesh in the viewport. Floor Toggle the display of the floor. Sky Toggle the display of the sky. Floor Height Offset Height offset for the floor mesh (stored per-mesh). Grid Toggle the display of the grid. Highlight Origin Highlight the origin lines on the grid. Background Brightness Change background color and assign a brightness value. UV Visualization Toggles the display of the mesh's UVs for the specified channel. Normals Toggles the display of vertex normals in the Preview Pane. Tangents Toggles the display of vertex tangents in the Preview Pane. Binormals Toggles the display of vertex binormals (orthogonal vector to normal and tangent) in the Preview Pane. Hierarchy Local Axes Show or hide local bone axis (All, Selected Hierarchy or None). LOD Auto Automatically selects the Level Of Detail (LOD) (this is the default setting). LOD 0 Selects LOD 0 as the LOD. x0.1 Sets the playback speed to 0.1.
x0.25 Sets the playback speed to 0.25.
x0.5 Sets the playback speed to 0.5.
x1.0 Sets the playback speed to 1.0 (this is the default setting). x2.0 Sets the playback speed to 2.0.
x5.0 Sets the playback speed to 5.0.
x10.0 Sets the playback speed to 10.0.